FRANKFURT, Germany & LONDON — (BUSINESS WIRE) — December 6, 2016 — Arago, a pioneer in artificial intelligence (AI) and leader in intelligent IT automation based in Frankfurt and New York City, today announced that HIRO (Human Intelligence Robotically Optimized)™, the company’s flagship AI technology capable of learning, understanding and reasoning to solve problems, has defeated human players in the computer game Freeciv, after it became an unbeatable opponent for the game’s built-in AI. Freeciv is a turn-based strategy game inspired by the popular Sid Meier's Civilization series. This signifies a major step forward in one of the challenges in the development of AI: evolving decisions from brute force testing, to more nuanced role playing without defined outcomes for victory. 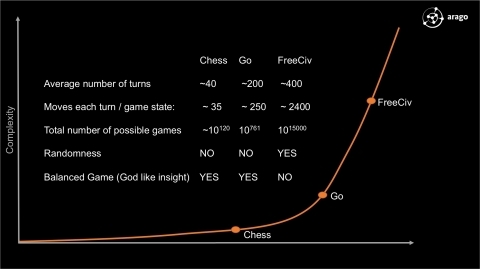 The announcement, which included game footage screened Tuesday afternoon at TechCrunch’s Disrupt London 2016, represents an exponential advancement in machine intelligence due to Freeciv’s game complexity. With all the different options, opponents acting unpredictably, and changing parameters throughout the whole game, there are more than 10 to the power of 15,000 possible games imaginable – for comparison there are only 10 to the power of 80 atoms in the universe. Advancements from simple trial and error represented by machine learning, to combining this approach with machine reasoning that takes the “why” into account was Arago’s goal. On top of the scientific showcase of winning Freeciv the same HIRO system is used by global enterprises for automating IT operations across the entire IT stack. Commercially, the HIRO platform amplifies human IT experts through continuous learning and built-in self-optimization. Despite the fact that Freeciv holds an exponential amount more moves than Go, Arago’s HIRO actually required less data and trainers in order to advance to victory. Winning against human players is a major milestone, because it shows that hybrid systems of machine reasoning and machine learning can reuse their knowledge and though easily be trained by different independent coaches simultaneously. Boos spoke with former TechCrunch Editor John Biggs onstage at TechCrunch’s annual Disrupt conference in London where the crowd was treated to a time-lapsed encapsulation of wins against humans and other outstanding scenes from game play.